Many MEA members and leaders got their first close-up look at Gretchen Whitmer, MEA’s recommended gubernatorial candidate, at last week’s Bargaining, Public Affairs & Professional Development conference. Now it’s your turn. 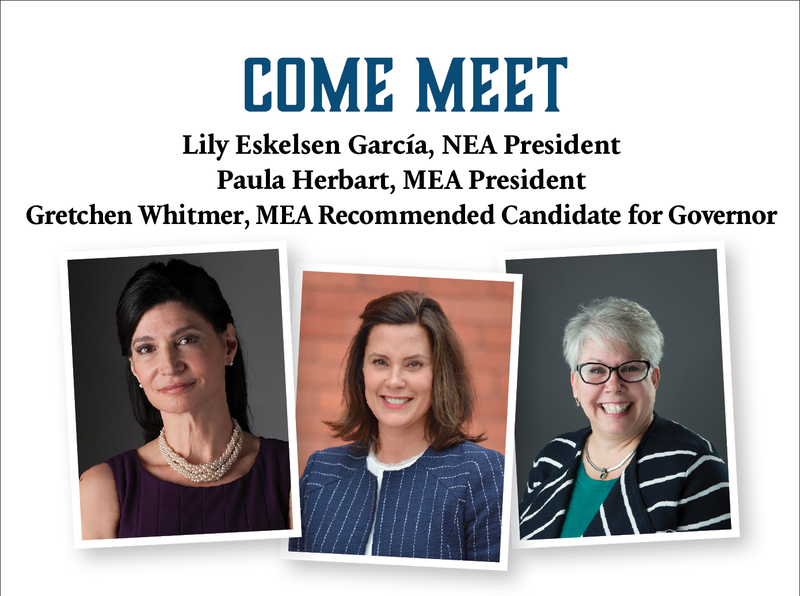 Whitmer will be joined by MEA President Paula Herbart and NEA President Lily Eskelsen García at a meet and greet tomorrow, Tuesday Feb. 13, from 3-5 p.m. at MEA’s Plymouth office. RSVP for the event here. Kevin Grammens, a teacher in Anchor Bay School District for 20 years, said “It was a relief” to hear Whitmer commit to supporting educators and investing in public education during her keynote address at MEA’s biggest conference of the year at Detroit’s Cobo Center. “It was inspiring to hear from someone who’s going to back up students and teachers,” Grammens said. Amy Graham, a teacher from Wayland Union Schools, called Whitmer’s speech invigorating. “I’m ready for change and excited by her enthusiasm,” Graham said. In a personal speech touching on her beliefs and motivations, Whitmer pledged support of public education as the “backbone of our economy.” The first woman to be chosen as Democratic leader in the state Senate, Whitmer is the daughter and granddaughter of educators and a former county prosecutor. She has fought tough battles in her political career, including fighting diversions of money from the School Aid Fund and voting against the law that allowed the state to illegally seize 3 percent of school employees’ wages to pay for retiree health care. Conference goers were asked to submit their education priorities to Whitmer in writing after the conference. All MEA members can share their education policy ideas with Whitmer through this Action Network page. With so much at stake in the 2018 election, NOW is the time to get excited and involved. Please RSVP now to meet Gretchen, Lily and Paula and learn how you can help us win for public education this year.